Banbridge U18 rugby team will begin their Nutty Krust Rugby Floodlit Tournament campaign with a first round tie against Omagh. The club last won the trophy in 2013 but missed out on the final last year as Dungannon won the tournament with a win over Malone. Their opening round game will take place on 25th February at Chambers Park, Portadown. Dromore, meanwhile, were given a bye into the second round. Also in the first round, Ballymena play Larne while Clogher Valley take on Rainey. Getting byes to the second round are Ballynahinch, Malone, Portadown, Randalstown. This is the 36th year of the floodlit tournament, that was previously contested by U19 teams. Due to restructing, it is now competed for by U18 players. Irwin’s Bakery has been supporting the tournament since the first match was played 36 years ago. “The much-loved tournament is a fantastic opportunity for young talent to hone their skills and play competitively at a high level against their peers from across Northern Ireland. 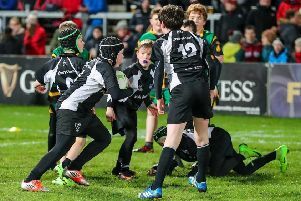 Irwin’s has a long history of supporting grassroots sports development in a range of different disciplines – and it’s been rewarding over the years to have seen young players progress from the tournament to the highest level in the sport.